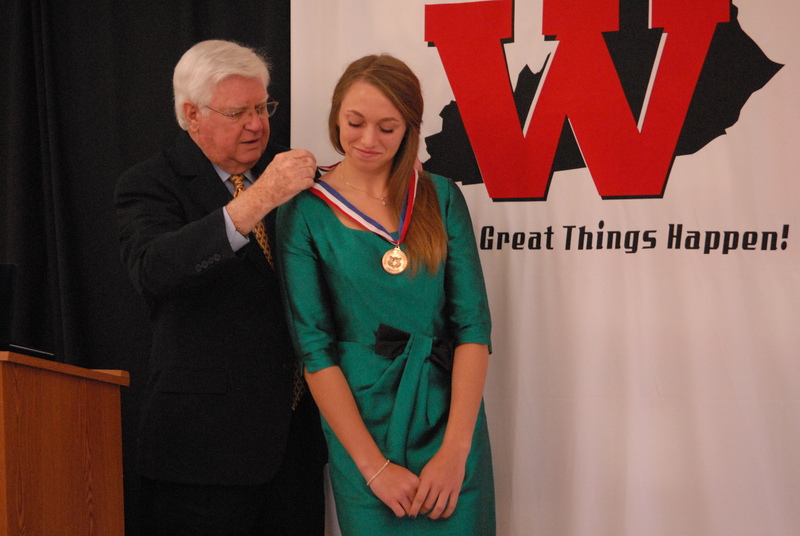 Today, Congressman Harold “Hal” Rogers (KY-05) presented Whitley County High School junior Kori Sears with the Congressional Award Bronze Medal. The award recognizes Sears’ volunteer efforts to improve Whitley County and achievement of personal development goals. Photo Cutline: Rogers awards Kori Sears with the Congressional Award Bronze Medal. To earn the bronze medal, Kori completed 100 hours of voluntary public service, including helping children learn to read and use computers during an afternoon reading program. For personal development, she learned to draw and paint with acrylics. For physical fitness, she improved her tennis skills. For her expedition, Kori took an overnight trip of horseback riding in the Big South Fork National Park in Tennessee. Additionally, Kori graduated from the Rogers Scholars program this summer and served as a junior counselor at Camp UNITE last year. Her advisor for the program is Tania Sharp, a guidance counselor at Whitley County High School. Kori's work exemplifies the cornerstones of the Congressional Award: service to others, initiative and achievement. The Congressional Award is open to all young people ages 14-23 in America. To earn the Award, young people must set and achieve goals in the four program areas: voluntary public service, personal development, physical fitness and expedition/exploration.